On Sunday Bethany and I drove to a wonderful non-touristy bakery In Anacortes for breakfast. They had lots of good things there, but the muffins are what they are famous for. They are these huge things that can comprise a whole meal in of itself. They also have lots of different flavors. I was debating between lemon poppy-seed or strawberry rhubarb. I like LOVE strawberry rhubarb pie, and since it’s such an unusual flavor I went for that muffin. Bethany went with the peaches and cream muffin (which was also delicious). My muffin was FABULOUS. I could definitely get used to having a bakery like that around every day! Although I would be a great deal poorer if that was the case. After lingering over our muffins, we drove around Anacortes looking at houses through the suburbs, and driving through a couple of parks. We still had a little time to kill before we had to meet the ferry, and we decided to drive up to a lookout point overlooking the town. We didn’t spend too long up there even though the scenery was beautiful because of the cold winds. After puttering around for the morning it was time to board the ferry to Friday Harbor. 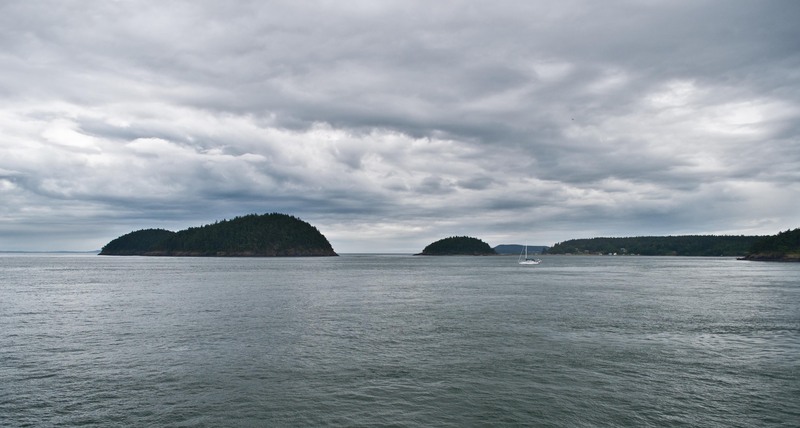 Some more of the San Juan Islands passing by while on the ferry. The ferry to Friday Harbor from Anacortes takes about an hour, and the scenery is so beautiful. Friday Harbor was also much warmer with part clouds and part glorious sun, so it felt good to shed the rain gear and walk around in a t-shirt. 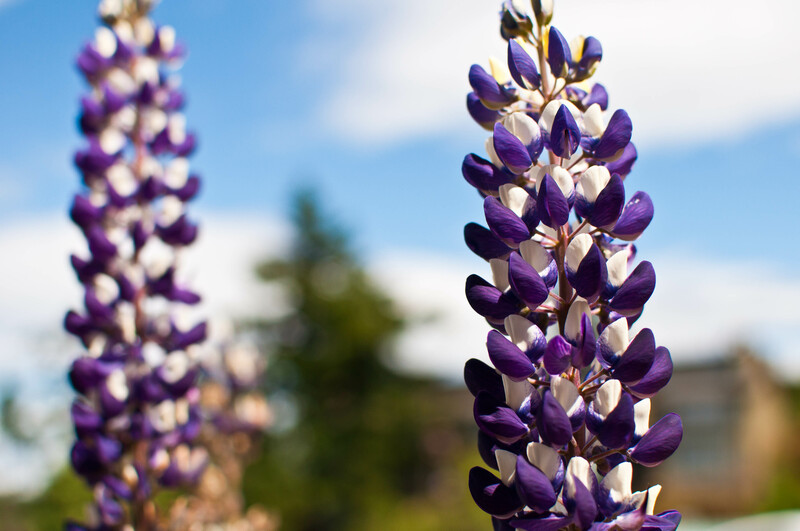 Pretty lupine blooming their hearts out. These were growing just off the sidewalk in town. 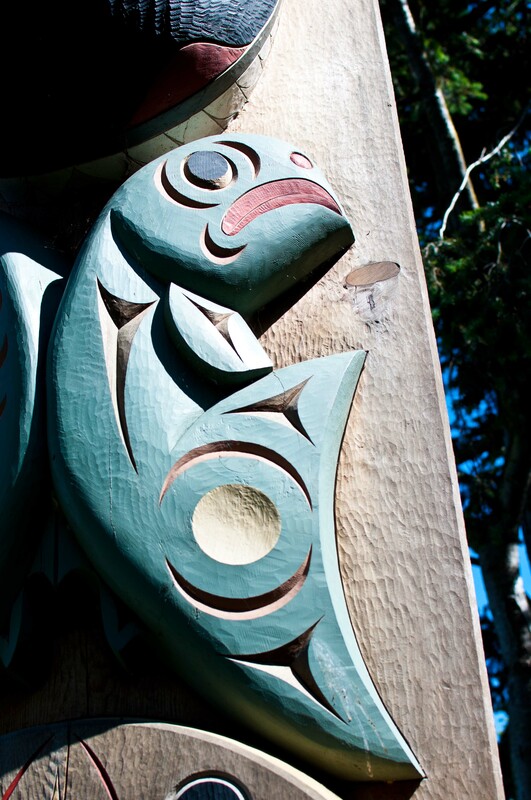 A Salish carving depicting a salmon. 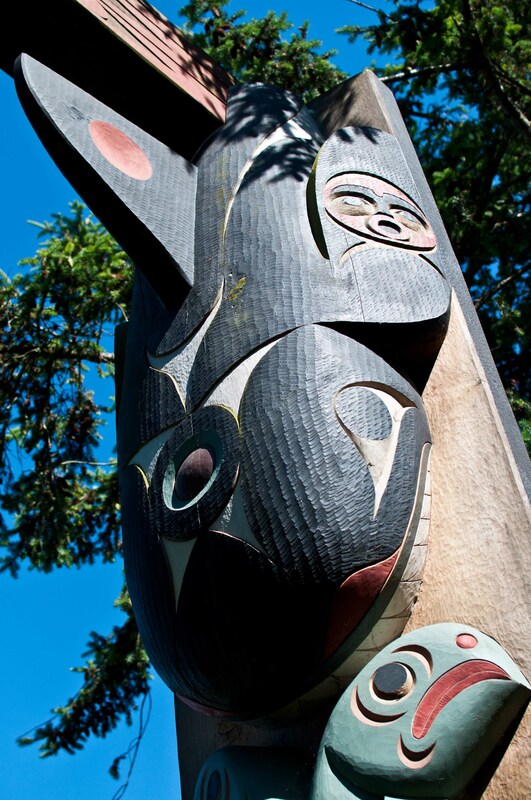 An orca carved just above the salmon. I love the patterns and colors in this one. 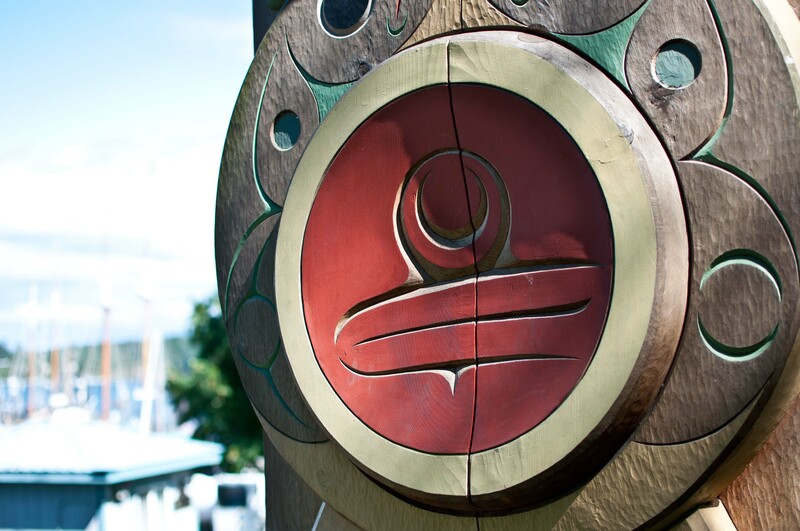 Friday Harbor is such a cute town, albeit a bit touristy, but hey, we WERE tourists for the day! It was fun wandering through the shops looking at all the trinkets and art. There were even a few really cool new and used bookshops. One of my favorite shops was a lavender shop. Everything in that store is made with lavender, from soaps and candles, to laundry detergent to honey, salsa, and even ice cream! They have their lavender farm right there on San Juan Island, not too far from Friday Harbor. I picked up a wonderful candle for my mom since she loves lavender so much. It is one of the best candles I’ve ever smelled, it smells like your sniffing the flowers straight from the bush. I picked up a t-shirt for my dad, and after looking through the whole town went back for my souvenir. My mom started this tradition in our family of getting a Christmas ornament on every trip we take. We now have hundreds of ornaments that decorate our tree. Although not every one of those came from a vacation, we still have tangible reminders of our trip to Europe, Canada, and other places around the US. I had started continuing this tradition quite a few years ago with my trip to the White House and getting the official White House ornament for that year. Now I make it a point to not only get an ornament, but get something that is indicative of that place. For this vacation, I had a hard time deciding on whether to choose the glass octopus (he was SO cute!) 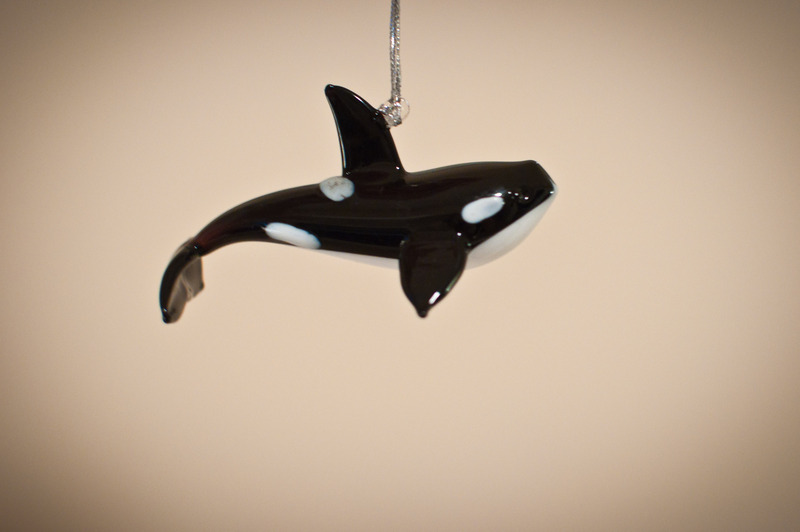 or the orca. The orca won out, they are just so iconic of the San Juan Island area, and I love this fascinating, mysterious, and mythic animal. Part 3 of my vacation is coming soon!